A few weeks ago, I shared some reflections of formative experiences that I had as a teenager in United Synagogue Youth with last summer marking 25 years since I traveled on USY on Wheels and this coming summer marking 25 years since I traveled to Poland and Israel with USY Israel Pilgrimage/Poland Seminar. With tomorrow marking Yom HaShoah, I want to reflect a bit on my trip to Poland not just from the perspective of my personal anniversary, but also from the perspective of another significant anniversary this year: the 70th anniversary of the Warsaw Ghetto Uprising. In fact, Yom HaShoah’s official name is Yom HaShoah v’hagevurah, Day [of remembrance] of the Shoah and of heroism. The date of the 27 of Nisan was deliberately chosen by the government of the new State of Israel to connect national remembrance of the Shoah with the most notable case of armed resistance that the Jews were able to wage against the ruthless Nazi machine. The State of Israel sent a clear message in selecting the name and date of the holiday: Jews did not merely walk passively like sheep to the slaughter, but also stood up in self-defense against impossible odds. For years, I had my pictures packed away in boxes. For the Poland portion of the trip, I shot all of my photos as slides. My thinking at the time was that I needed to come back to the States at the end of the summer and share my experience with others. At the time, a slide show was an efficient means to do that, and I did show them several times in groups. Then I went off to college and adult life, and the slides stayed in a box. Technology moved on, and I can’t remember the last time I’ve even seen a slide carrousel. All this vital documentation of my journey, and I couldn’t even look at it. With my recent reconnection with many of my travel mates, I decided that to mark the occasion of the 25th anniversary I would convert the slides to digital format. I’ve started to do that and recently got back about four rolls worth of film on disks that I can view on my computer and easily share with others. It happens that most of the slides that I have converted so far were from Warsaw, including from a walking tour of the neighborhood that was built over the site of the Warsaw Ghetto. Now I can revisit in full color the harrowing experience of visiting the Warsaw Ghetto 25 years ago. 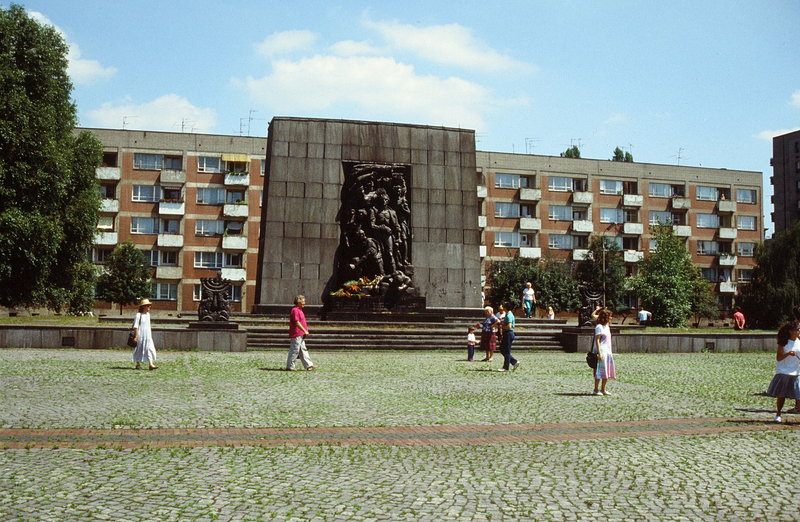 There was a picture of a modest monument that read in Hebrew and Polish: “From April 19 to May 15, 1943, there took place a rebellion in the Warsaw Ghetto, a war of heroism of Jewish fighters for the honor of mankind.” There was the much larger Nathan Rappaport memorial in the heart of the neighborhood courtyard. I took a picture of a street sign marking Mila Street, just a few doors down from Mila 18, the address made legendary by Leon Uris where the Bund plotted the fateful uprising. I found pictures of remnants of the brick wall that had once encircled the ghetto and imprisoned the Jews there in squalid conditions. 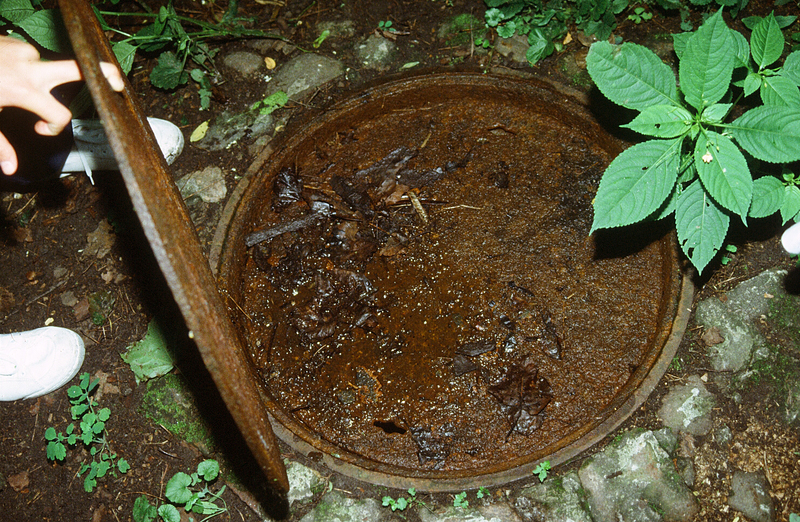 There were monuments over manhole covers over the sewers, where thousands of Jews desperately tried to hide and cling to life, even while knowing the blood thirsty Nazis would hunt them down in the sewers. In one of my photos, there’s a manhole cover that wasn’t an official monument that a staff member lifted up. It was closed with a thicker cover underneath, but the photo makes the point that people crawled through these small holes. Then there was Umshlagplatz, the gathering place in the Warsaw Ghetto where thousands of Jews a day were gathered on trains and sent to Treblinka to certain death. I reflect on my experience visiting the Warsaw Ghetto and consider that to be a vital stop on pilgrimage of bearing witness to the Shoah. The Jews faced hopeless deprivation and yet, in this squalid ghetto, Jews dared to hope for a better future. This monument to Jewish suffering epitomizes the precipice between hope and despair. This week’s Torah portion, Shemini, also describes a similar sort of precipice, the precipice between creation and destruction. Rabbi David Wolpe writes that the most important day of creation in Genesis is not the first day when God created the heaven and earth, nor the sixth day when God created human beings nor even the seventh day when God rested. Rabbi Wolpe writes that the most important day was the eighth day. We began our lives in a real sense then, on the fateful eighth day –Yom Shemini. What happened then was not so great once God turned creation over to us. Adam and Eve get in trouble; Cain and Abel have their strife; humanity completely degrades. Rabbi Wolpe writes: “We are blessed and cursed with the eighth day. For as we are given the start to creation, we are also mandated to carry it forward.” On Yom HaShoah, we recall the worst “eighth day” in human history, the twelve dark years of Nazi terror in Europe. The Nazis arrogated to themselves the powers of God that have roots in the initial eighth day of creation when God let go of the reins and said to humans, you run the world. At the same time, out of the ashes of the Shoah is a glimmer of hope that humanity can muster the courage to confront evil. That is the message of the Warsaw Ghetto uprising. The brave men and women who stood up to the Nazis refused to accept the reality of a God-less eighth day of creation. They sought to restore justice to the world. They may have died in their efforts, but they gave the world the gift of their legacy that whatever curses the eighth day brings, our task is to turn them into blessings.